Enjoy Afternoon Tea from £12.50 per person. Offer available between 12pm - 3pm Tuesday - Friday. Book online for free text confirmation or call 01604 283 160. 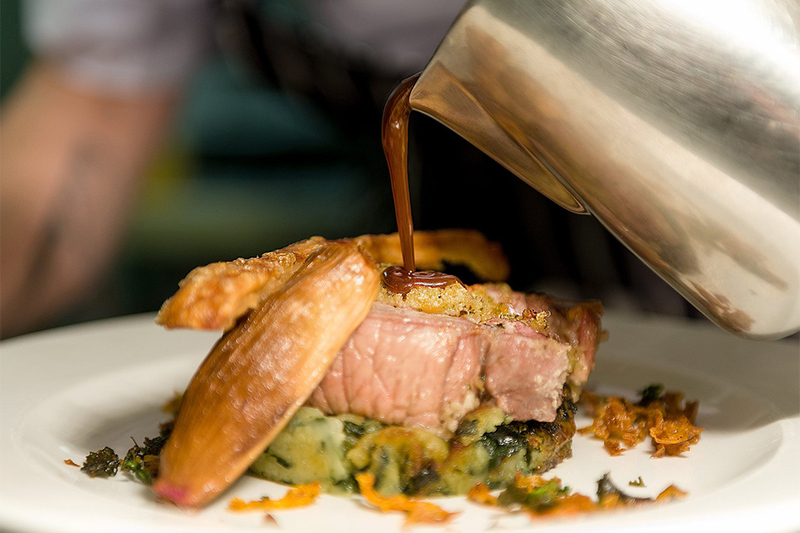 Treat yourself at the weekend by tucking into a delicious two course Sunday roast. 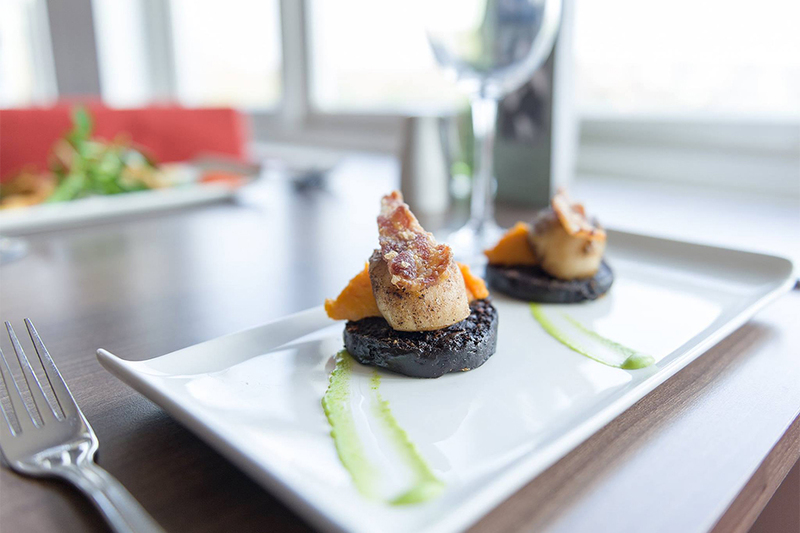 Please note you can also choose a three course option for £19.95, or one course for £10.95. Sunday lunch is served between 12-3pm every Sunday. Book online for free text confirmation or call 01604 283 160. Treat yourself at the weekend by tucking into a delicious three course Sunday roast for just £19.95. Please note you can also choose a two course option for £15.95, or one course for £10.95. Sunday lunch is served between 12-3pm every Sunday. Book online for free text confirmation or call 01604 283 160. 2 of the cakes weren't to our taste. Lumpy lemon slice and brownie was more like a cake consistency. This was complementary due to a poor lunch experience....so v. good value. Egg sandwiches were over full....hard to eat delicately. Scones were amazing as was the fruit crumble slice. Lovely pleasant staff. Food was okay and good value for 3 courses but average quality. Cutlery and glasses were not very clean and had to ask for some to be replaced. Has the potential to be really nice if quality improves. Excellent value Sunday lunch- good for family occasions. Lovely views over lakes on golf course. Food well presented. We had afternoon cream tea. Expected a delicious plate of special club style or dainty fresh selection of sandwiches with it but instead we got 4 mini rolls cut in half with mediocre boring fillings to share between two of us. Then an unusually large selection of what appeared to be defrosted miniature cakes/desserts, 4 each and a scone each served with jam and clotted cream. Would have been far nicer to have had a nice variety of special fresh cut sandwiches followed by fewer fresh cakes and scones. Tea served with it was not very nice quality either. Have to say though, restaurant setting and service were fantastic! Would still go there again. Staff were pleasant and helpful but long wait, no atmosphere, few decoration effort. Afternoon tea was lovely. The restaurant was very quiet. We got lots of attention and wanted for nothing. Thank you we will be returning. The food, location and staff were great. The drinks especially the wine and beer were very expensive. Couldn't fault it, my friend & I had a lovely meal on Sunday from a set priced menu but the choices for each course were lovely. As for the lemon & honeycomb Eton mess...loved it. Nice light airy venue great views over the golf course, staff very attentive without being overpowering, nothing was to much trouble and they were warm & inviting. Food, service & value were very good it was a shame that we were the only couple dining. Very quiet lunchtime meal and so convenient to meet friends travelling on the M1 - lovely restaurant overlooking golf course. Lovely afternoon tea in a nice setting, food was excellent and the staff very friendly. Will definitely go again. Great service and meal at Green's. Nothing was too much trouble. Had a great meal, with a great view. We were a bit apprehensive about trying this as they never answer the phone! However we did book online which worked well. The overall impression is a good one, we were greeted warmly both at the entrance and by the waitress. 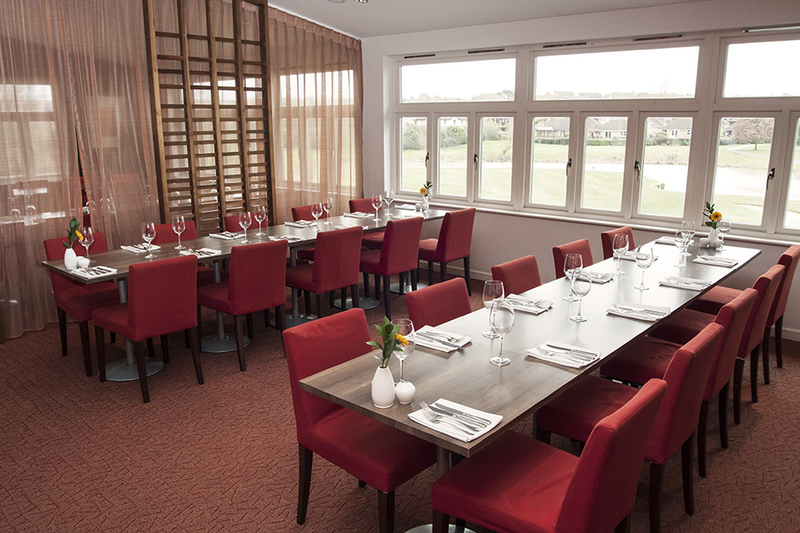 The restaurant is upstairs with great views of the 18th hole. The room is very modern and the food was in fact very good. Served quickly and hot with a good presentation, it tasted fine. Some tiny hiccups with missing veg and the ham strips in the fig salad were tough but ok overall. Good service here, and very friendly. A fab place for all the family to go to. Food fantastic and service great! Greens Restaurant is a lovely place to go to. The service and food was fantastic, and the views of the golf course superb! I would definitely recommend people to go there. I took a client to Green's for lunch, the service was only surpassed by the food - delicious! We had all 3 courses and I personally would highly recommend the lime and chili chicken and a to die for cheese cake! The Sunday Lunch was nice I had the lamb and one of my friends went for the Beef which she enjoyed, however the other friend I was with ordered the cod it was like rubber she couldn't even chew it. We complained so they were kind enough to bring out another one for her which I'm afraid to say was no better. It was a disappointment as it was a treat from a good friend I have been many times before and I've enjoyed the meals but unfortunately it all went wrong yesterday due to the fish course. Had a good meal and a very enjoyable time at the Green's. Lovely visit to Green's Restaurant and once again so warmly welcomed by D - Delila - such a delightfully warm person - worth going just to be welcomed and served by her! The only minor which I would like to make and would respectfully suggest that you bear in mind and that is to ensure that the plates are very hot before serving - dinner became too cold too quickly. Good food and value for money at Green's. Always very friendly service, but sometimes lacks a bit of atmosphere. BBQ event was a bit disappointing for the 4th July as the entertainment was not great and food kind of rationed. Went for an evening meal with friends at Green's Restaurant and was very satisfied with the service. Food arrived quickly and was presented well. Very friendly staff too. My favourite restaurant in Northampton. A very nice Mother's Day meal, for 6 of us. Portions were on the small-side but, it was tasty and hot. Service was OK, for a busy-lunch. 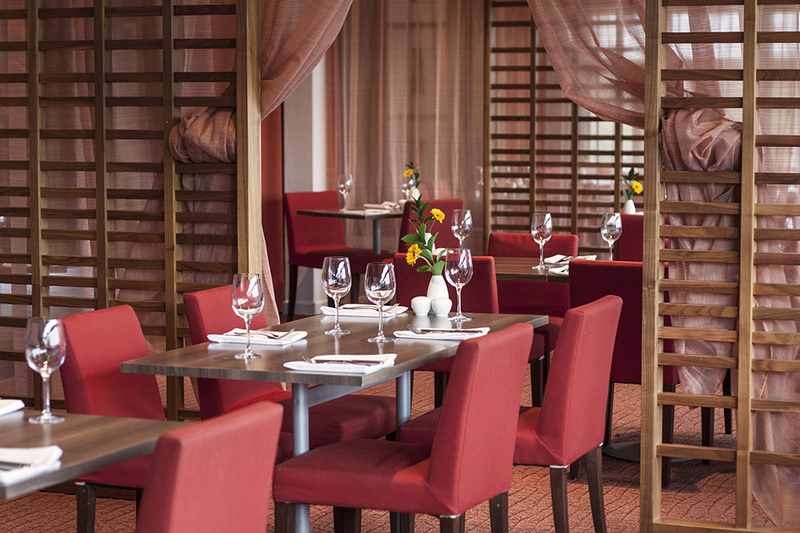 Very good food and service; ideal location for a business lunch. Food nicely presented, good choice of more sophisticated dishes. It was nice but didn't wow me. Good place for large parties because plenty of room so you aren't squashed in on top of other diners. Large bar in which to congregate for pre-dinner drinks. Not the place for a romantic dinner for two but good for 12 people who wanted to talk. We all got lost and the building needs to be better sign posted. Google map is misleading. Yes - you do need to go to the club house which is before you get to the Virgin gym. Both young and old enjoyed the meal we had here on the 1st of July would go back there again anytime. Overbooked and short staffed. Had to wait over an hour between courses and then two meals were inedible. Hopefully a glitch as this is not typical of Greens. Will give them another go! Everything about this special meal was excellent, including the added bonus of discovering that the meal was less expensive than anticipated. had a unscheduled day without the kids so decided to take wife out for Sunday dinner. We both enjoyed the meal immensley. Greens had a good selection of starters,mains and sweets.It was the best roast beef that I have had for a long time and the cheese cake was really light and tasty. We will definately be visiting Greens again for another enjoyable experience. Good location and view from the restaurant. Food and service good, but selection limited. Service was not up to their usual standard. Biggest dissapointment though was the food. Three fillet steaks ordered and one chicken dish, 2 steaks were over cooked, waited ages for replacement ones, the other two diners had finished their mains before they were brought to the table. Sadly, once again, one steak had sinew covering it which should have been removed, so asked for it to be taken away. Appetite by then had diminished and we had been in the restaurant for a couple of hours by this time. Chef was most apologetic, but by then we had become disappointed to say the least. What should have been a great celebratory evening turned in a disaster. To be fair though we have not had poor quality meals here in the past, and the chef did say they had changed their butcher, may be good to go back to the old one as quality has suffered since the change. As always just a brilliant experience. The food was amazing - you definately get what you pay for. Jane Preston-Cooper. Very pleasant and enjoyable will book again. Although the food was absolutely fantastic - the rest of the evening let my rating down...the table waitressing was poor- no bread with the soup and had to ask..forgot to give us our coats on departure...I would come again purely because the food was superb...but i would still prefer bigger portions as i left quite hungry. We couldn't fault Greens in anyway. The food was delicious and the service was excellent too. The food is slightly more expensive than I normally pay but the food and service is certainly worth the money! 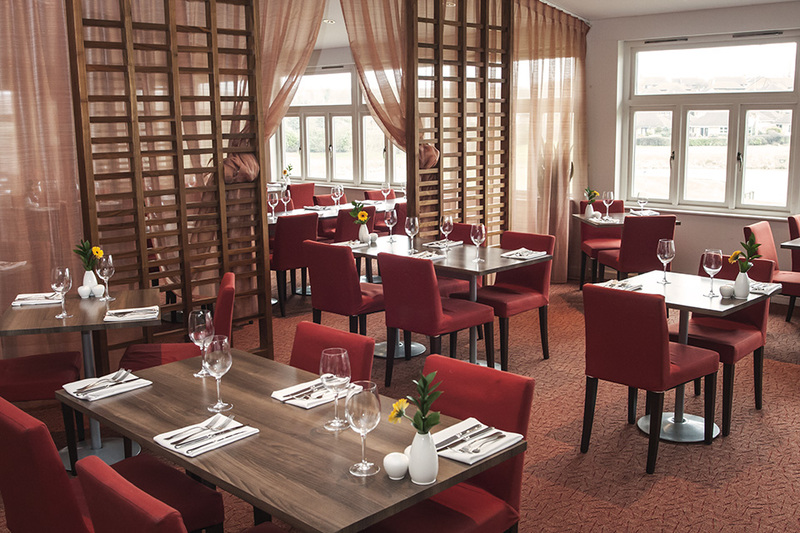 Set on the Collingtree Golf Course, Green’s Restaurant is a real haven for those looking to escape the hustle and bustle of city life whilst still maintaining good transport links with easy access to the A45 and M1. 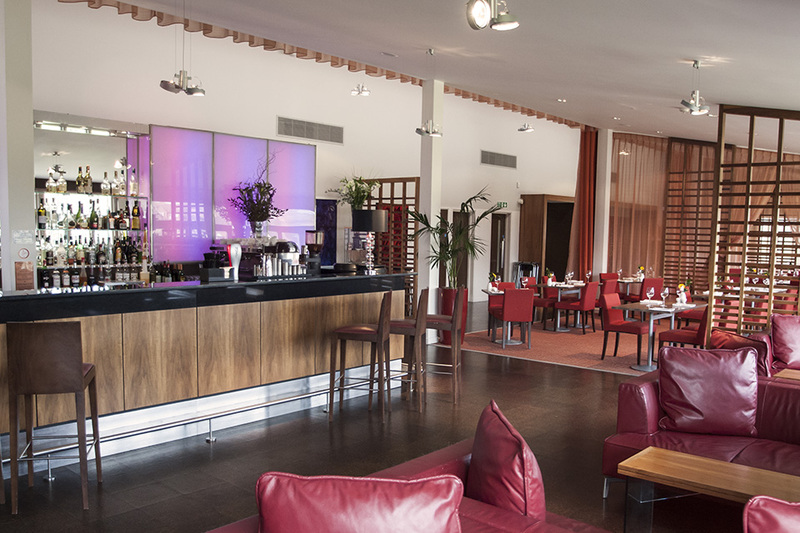 Opened in 2005, the restaurant sits on the first floor and provides spectacular views onto the 18th green: it's certainly impressive, whether you're a golf fan or not! The restaurant's sophisticated interior was uniquely designed by a London-based design agency who modelled the space in order to take advantage of its elevated position. 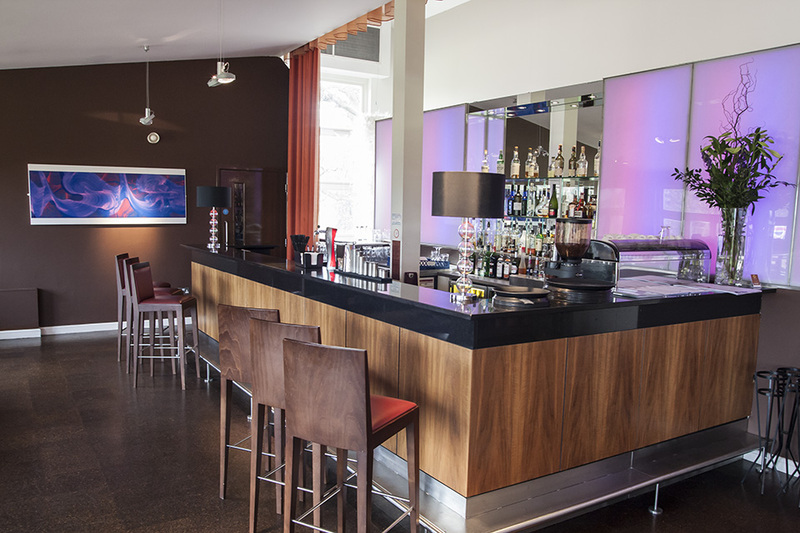 The addition of a slinky cocktail bar means that all visitors are catered for, whether they are dining from the a la carte menu or enjoying a glass of wine with a few bar snacks. Renowned for sourcing their produce locally and turning it into fresh, delicious, home-cooked dishes, Green’s is a foodie’s haven. Local suppliers such as Elliot’s, a local family-run butchers, deliver fresh produce daily and the menus are centred around fresh and unfussy ingredients. 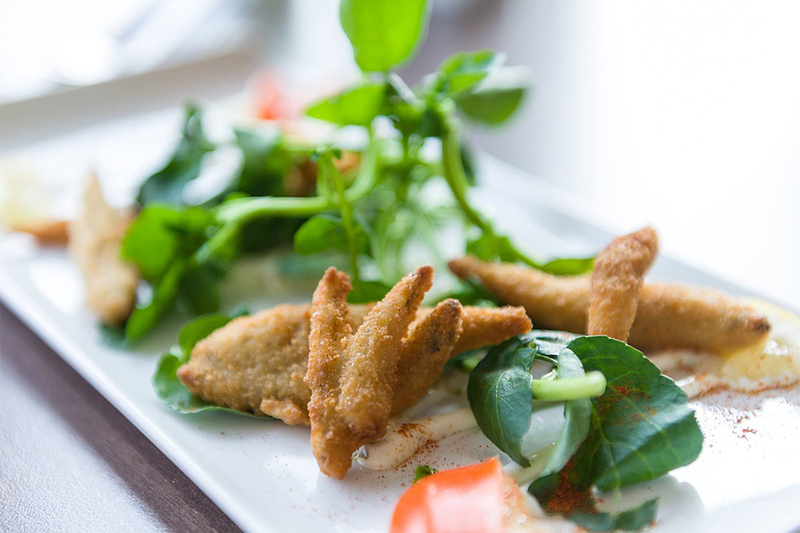 To start, we'd recommend the tempura king prawns with spicy chilli sauce, or the grilled fig with English stilton, crispy parma ham, mixed leaves and a balsamic reduction. When it comes to mains, there are plenty of grill options: from the chargrilled garlic and parsley marinated chicken breast burger to classic steaks served with vine roasted tomatoes, flat mushroom, mixed salad and hand cut chips. There are then traditional mains available such as hand battered cod fillet and the steak and ale pie. If you fancy something a little different, the baked salmon with crushed new potatoes or the pork fillet saltimbocca with sautéed potatoes and red wine jus are the perfect choices for you. 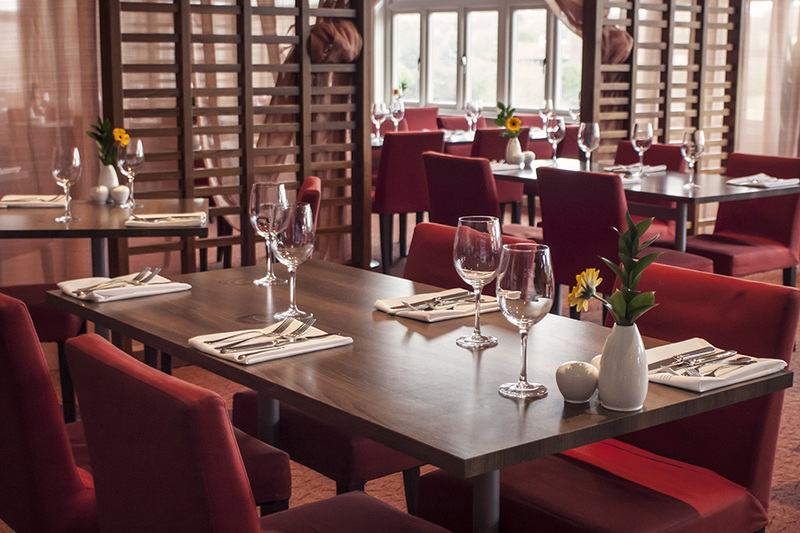 To accompany the delicious food, you will find an impressive wine list as well as a good selection of beers and cocktails; with restaurant manager Jason at hand to advise you on appropriate combinations, you’ll feel leaving well looked after and fully satisfied. 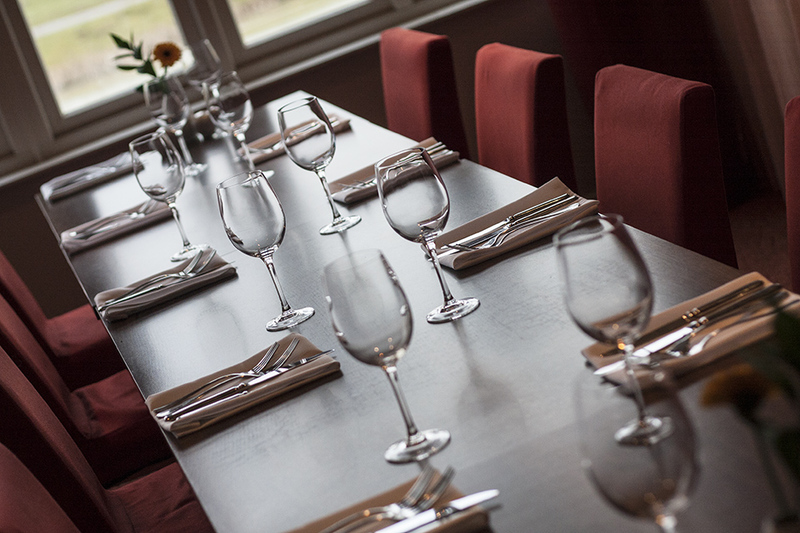 Green’s is the perfect venue for couples, business lunches or larger groups looking for a sociable evening of wining, dining and conversation. 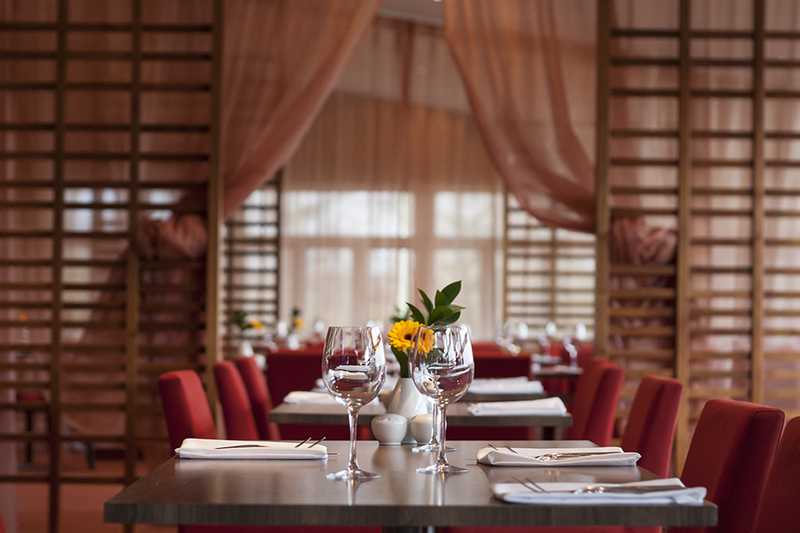 As it is also available for private hire and can cater for a wide range of special occasions such as weddings, private parties office parties and more, it’s no wonder that it has won various local awards and is one of the most popular dining destinations in the area. Enjoy Afternoon Tea from £12.50 per person. Offer available between 12pm - 3pm Tuesday - Friday. Treat yourself at the weekend by tucking into a delicious two course Sunday roast. 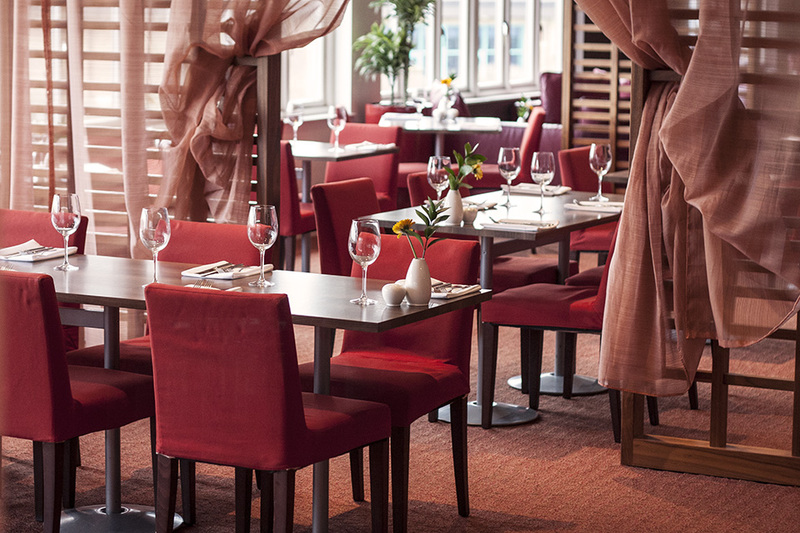 Please note you can also choose a three course option for £19.95, or one course for £10.95. Sunday lunch is served between 12-3pm every Sunday. Treat yourself at the weekend by tucking into a delicious three course Sunday roast for just £19.95. Please note you can also choose a two course option for £15.95, or one course for £10.95. Sunday lunch is served between 12-3pm every Sunday.